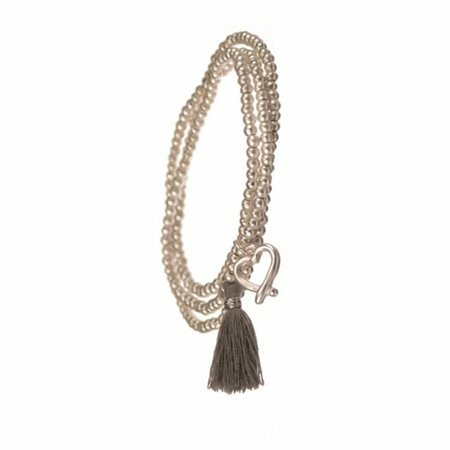 A classic string of silver seeded beads has been given a totally new look for the new season by the addition of two very cute charms an ultra-feminine silver heart and grey coloured tassel. Add a triple layered look for a new blend of style and sophistication. Elasticated for a one size fits all simplicity and can be worn as a bracelet or a necklace. A classic string of silver seeded beads has been given a totally new look for the new season by the addition of two very cute charms ��� an ultra-feminine silver heart and grey coloured tassel. Add a triple layered look for a new blend of style and sophistication. Elasticated for a one size fits all simplicity and can be worn as a bracelet or a necklace.